From Saturday Morning Breakfast Cartoon, just so you know where I got this from. If you are fortunate enough to live in the north woods, then you know that the "Dog Days of Summer" (Wiki) are followed by the Dark Days of Summer. These are the days that our house gets to be quite dark inside even at midday with the sun shining. The sun is now taking a lower path across the sky so that the sunlight cuts across a wide swath of tree leaves, effectively blocking and scattering much of the light. This will continue and worsen in the weeks to come until the leaves fall. This darkness does not occur in the Spring as the leaves do not come out until early May and are rather small for a while at that. By that point, we are only a month or so before the solstice and the sun is on a quite high trajectory. The Highline Polycarbonate blog has an interesting post on branding and polymers. They have some interesting data which raises a number of questions. I posted my thoughts already over there; I would encourage you to at least read the post and then feel free to post your thoughts as well. I've always found the information (or at least knowing that it exists) to be helpful. By having SI, articles can be kept shorter and have good flow - the details are elsewhere, much like a footnote. Articles often have page restrictions, but SI, being electronic, is without such restrictions. The editors of the noted journal sees all of this as problematic for both the authors and reviewers. "Reviewer demands in turn have encouraged authors to respond in a supplemental material arms race. Many authors feel that reviewers have become so demanding they cannot afford to pass up the opportunity to insert any supplemental material that might help immunize them against reviewers’ concerns." Add to this the knowledge that any paper can later be retracted and you have reduced the supposed certification to vapor. Peer review: three people looked at it and liked it. That's all, nothing more. It is not a proof of correctness, it's just proof that three people looked at it and (probably) liked it. Tip of the hat to Matteo Cavalleri for the lead. The journal "Nature Methods" has a 1-pager in the August 2010 issue (see  below for access comments) on the use of color to present data and some of the challenges. Most of us are familiar with FEA output that shows stress/strain/temperature or whatever in a 3-D illustration, with various colors equated to various values of the variables. While the author of the article has his own criticism of some practices in using color, I think most of those are weak  and he misses the real issues. One valid point made by the author is addressing some of the optical illusions that can occur. We all seen examples were a color can look to be different if the neighboring colors are different. The approach suggested is to not only scale the colors, but also the saturation of the colors - basically use the gray scale as a second dimension. An added advantage is if the output is later printed in B & W instead of color, all the information is not lost. It's a good idea, one that I will see if I can get our FEA guy  to buy into. Access to this article is quite strange. A subscription to the journal is free, but if you want to look at any article online, then there is a pay-per-view charge. So plan ahead? FEA (and all computer modeling for that matter) seem to me to be something that you either do or do not. If you try and do it part time, you will be a miserable failure. For me, I do not. Let's take a trip back through time, way back to the early days of computer connectivity, back before Facebook, Myspace, blogging, instant messaging, and even back before chat rooms. Bulletins boards, well I think that is going too far back, but somewhere in that gap between bulletin boards and chat rooms there thrived this entity formally called the Usenet (Wikipedia), but also called newsgroups or discussion forums. The whole point of this post is that the Usenet served a valuble purpose that has not been replaced. Discussion groups do exist, but they are nowhere near as active as the Usenet was, and they seem mostly to be filled with students looking for someone to do their homework for them. I do miss taking a swing at the questions, and while I do occasionally get such questions from people who stumble upon this blog, they are few and far between. I'm going to try and set up a questions box on the sidebar and see if that can change things. If anybody knows a simple way to do this, I'd be happy to take any shortcuts - "Dang it Jim, I'm a polymer scientist, not an HTML coder!" Not stuff that would be more appropriately acquired on the job, but academic stuff that would have been helpful and appropriate during the school years. And let me be clear: I'm certainly not picking on my teachers and professors, most of who were quite good. Solubility parameters - oh, oh so useful in understanding polymer dissolution (and I'm talking about far more than just the Hildebrand cohesion parameter). When you need to talk to an electrical engineer about rheology, use "capacitors" and "resistors" instead of "springs" and "dashpots". "The Scientific Method", but only so I would know how non-scientists think I work (4 years of undergrad, 5 years of grad school and never once was the term used). Statistical process control, because it can be useful. Designed experiments, because other people think they are useful and you need to know what they are up to. How to effectively referee an article. Polymer additives. Everyone understands the polymers, but without the additives, all you have is a lab curiosity. That polymer chemistry, far from being dead, is more alive and robust than many fields of chemistry. Smart Materials and Structures Journal has a nice review article on "dry adhesives" - the microstructured surfaces that show unusual adhesive properties. 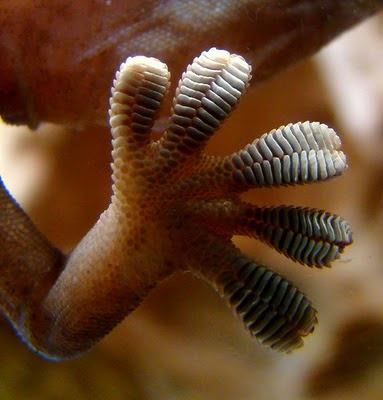 These are synethic copies of natural structures such as are most commonly assigned to geckos, but also exist with other animals . The current state of the art is summarized in the article and it is open access (with registration) for the first 30 days, so if you are interested, grab the article while you have a chance. You see the same type of name-calling with superhydrophobic surfaces being assigned to the lotus plant even though many other plants show similar behavior. I see it in the lady's mantle growing in my wife's gardens - Minnesota is just a tad too cold for lotus plants. This same dirt absorbing mechanism is a big part for the success of Post-It notes - they can be used and reused many times before showing a significant loss of adhesion - try that with masking tape or some other tape, especially on a lightly soiled surface. Post-It adhesive is not just any old weak adhesive, but a specially structured adhesive. I added a new page to this blog. Explaining what I do at Aspen Research can be difficult and won't ever fit into a single posting, so my (very) personal description of what we do is now available on a second page. You can click on the permanent "What we do and how we do it" link to the top left of this page or you can click here. The page certainly is my best description to date. I imagine that I will keep fine tuning it some over time, but not in any major way. "...that the results were not statistically significant, the study design cannot show cause and effect and there was no comparison group of men who were not attending an infertility clinic....As such, the newspapers have overblown the significance of this research, which does not provide evidence that BPA causes sperm damage or poor sperm quality in humans." "concerned that interest in Bisphenol A is reaching the level of a witch hunt with studies which have failed to provide reproducible results." The "witchhunt" statement is certainly ringing true to me, what with BPA being blamed for such a wide, disparate range of symptom and conditions. Following up on the opening of the world's largest PVC plant, Sibur is now putting together a large PP plant (I know, I know, all PP plants are large), this one being built in an even more remote spot - Tobolsk, Siberia. "Two 60 tonne, 38 metre-long slag purging columns were shipped by via the Indian Ocean and Suez Canal and overland through Europe to St. Petersburg, Russia, prior to delivery to the site. ...The biggest unit still to come from South Korea is a massive 1,000 tonne, 100m long propane dehydrogenation column which is destined for the Russian port of Arkhangelsk. From there, the 10m diameter column will travel by special barge up the River Irtysh to dock at the port in Tobolsk, which has been specially dredged and expanded to take the largest project equipment." As with most PP plants, these are built close to the supply of propylene, so I won't question as strongly the location of this plant, but the way that Sibur is expanding their polymer capabilities, it makes you wonder if there wasn't a very recent remake of "The Graduate". First, they are hiring: "Invista Hiring at US Lycra Plant" Good. Jobs are always a good thing. But then those jobs might not be around for long, as a mere two minutes later, the blog posted a PR blurb that they are considering selling: "Invista considers selling North America polymer and resin assets". There's no assurance that the new jobs would be on the block, but it still seems like a risk to be avoided if possible.